This article is about the museum in Stockbridge, Massachusetts. For the museum in nearby Pittsfield, see Berkshire Museum. 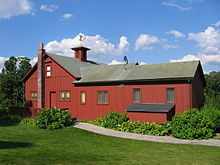 The Norman Rockwell Museum is an art museum in Stockbridge, Massachusetts, dedicated to the art of Norman Rockwell. It is home to the world's largest collection of original Rockwell art. The museum was founded in 1969 in Stockbridge, Massachusetts, where Rockwell lived the last 25 years of his life. Originally located on Main Street in a building known as the Old Corner House, the museum moved to its current location 24 years later, opening to the public on April 3, 1993. The current museum building was designed by Robert A. M. Stern. In addition to 574 original works of art by Rockwell, the museum also houses the Norman Rockwell Archives, a collection of over 100,000 various items, which include photographs, fan mail, and various business documents. In 2014, the Famous Artists School donated its archives, including process drawings by Rockwell, one of its founding faculty members in 1948, to the museum. In 2008, the museum received the National Humanities Medal from the National Endowment for the Humanities. In 2016, the museum received a grant of $1.5 million from the George Lucas Family Foundation, which will be used by "the museum's digital learning and engagement division to create multimedia experiences." ^ a b c "Museum History". nrm.org. Retrieved April 8, 2018. ^ "Mrs. Goulet Director of Corner House". The Berkshire Eagle. Pittsfield, Massachusetts. May 1, 1969. p. 20. Retrieved April 8, 2018 – via newspapers.com. ^ Donn, Jeff (April 3, 1993). "Simpler America Gets Fresh Start". Detroit Free Press. AP. p. 4. Retrieved April 8, 2018 – via newspapers.com. ^ Kennedy, Randy (March 20, 2014). "The Draw of a Mail-Order Art School: Famous Artists School Archives Go to Norman Rockwell Museum". New York Times. Retrieved 23 December 2014. ^ "Norman Rockwell Painting Collection". nrm.org. Retrieved April 7, 2018. ^ "Norman Rockwell Museum". neh.gov. 2008. ^ Cook, Bonnie L. (November 18, 2008). "Templeton Foundation among U.S. medal winners". The Philadelphia Inquirer. p. B04. Retrieved April 8, 2018 – via newspapers.com. ^ "Rockwell museum gets $1.5M grant from Lucas". Great Falls Tribune. Great Falls, Montana. October 4, 2016. p. L4. Retrieved April 8, 2018 – via newspapers.com. "FAQs regarding the Berkshire Museum's proposed sale of two paintings by Norman Rockwell". nrm.org. January 28, 2018. Retrieved April 8, 2018. This Massachusetts museum–related article is a stub. You can help Wikipedia by expanding it.